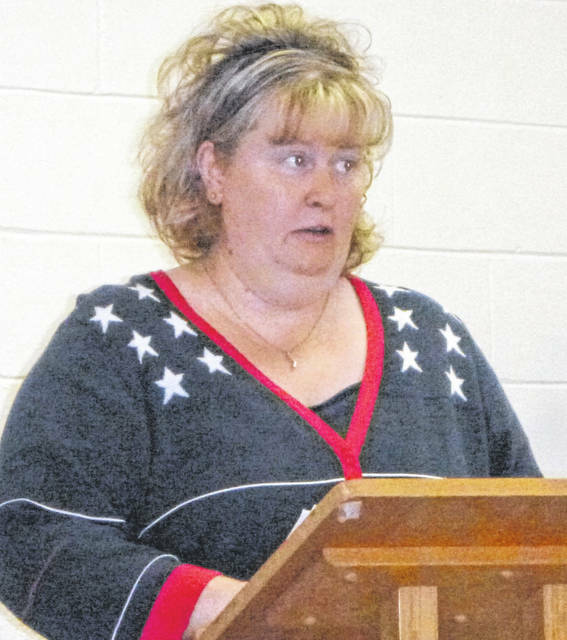 Angela High speaks about the noise and smell coming from Renergy Inc. during a meeting in Westfield Monday night. About 65 residents attended, along with Renergy management representatives. Renergy opened its facility in Westfield Township in September 2013. WESTFIELD — A crowd of about 65 residents who are concerned with the odor and increased traffic from Renergy Inc.’s operation packed the Westfield Community Church during a township trustees meeting Monday night. 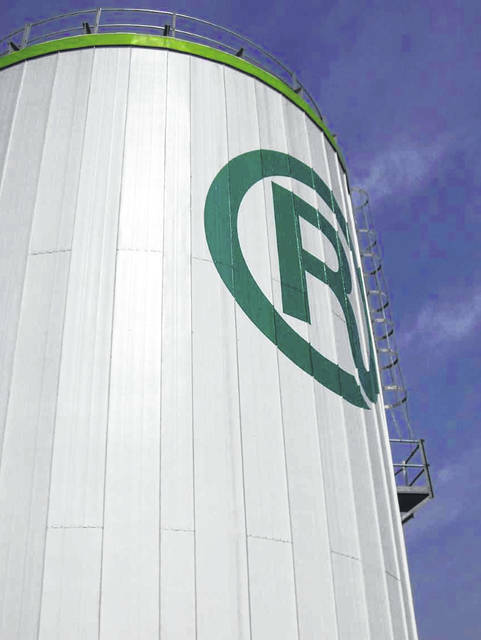 Cari Oberfield, chief operating officer of Renergy Inc., answered questions from about a dozen of those who complained of noise from the digester “at all hours of the night” to a foul smell in the air. She was joined by two other members of Renergy’s management team. Some in attendance also expressed concerns over possible groundwater contamination. At the heart of the matter, according to Morrow County Prosecutor Charles Howland, is whether the operation is still agricultural, for which the township is zoned, or is now considered a commercial industrial site. Howland said he will look into what legal action can be taken, if the company is in violation of zoning regulations. “It no longer has agricultural status, according to the Ohio EPA in its letter Dec. 20,” he said. Howland established that there is no hog feeding operation on the property. Several thousand hogs are housed in barns on adjacent land. A proposed lagoon that would hold waste just north of this village has residents upset. • Build a new 20.7-million gallon lagoon on their property north of Westfield between U.S. 42 and County Road 156. • Expand two current waste lagoons on their property. Angela High helped organize the meeting of concerned citizens. “I live on County Road 156, which is diagonal from the operation,” High said. High said she began the organized opposition to Renergy after her complaints “fell on deaf ears” and she began doing posts on Facebook. Biosolids is a term used for several types of treated sewage sludges that can be used as soil conditioner. Treated sewage sludge has long been used in agriculture, but there are concerns about offensive odors and disease risks from pathogens and toxic chemicals. Township trustee Joe Dreyer moderated the hour-long discussion. Dryer and trustees Brian Barkley and Rosie Warnstaff toured Renergy’s facility that afternoon. Oberfield said the company’s goal is to be environmentally friendly. “Agricultural rules are very different from corporations, which is what we’re used to. To be as good as we can be and along with that comes neighbors. We have employees who live right next door. It’s very important to us to create an environment … given everything you hear, the negatives, and we look at all those things,” Oberfield said. Oberfield said the Ringler family is no longer operating the company day-to-day. “They are investors, like we are,” she said. Those residents who complain about noise levels were advised to report it to the Morrow County Sheriff’s Office. The digester, installed by quasar energy group of Cleveland, works by converting livestock and municipal waste into usable energy; in this case electric. Digesters provide electric and natural gas potential, and reduce greenhouse gas emissions from waste, according to industry sources. The Ohio EPA sent a letter to Emerald BioEnergy, LLC dated Sept. 6, 2018, that addressed a violation involving the total combined biomass entering the plant. It is approved to receive 34,550 gallons per day; and has averaged 49,800 gallons per from Jan. 1-July 31, 2018. Thus, the flowrate exceeds the approved level. The EPA requested a plan be submitted detailing how feedstocks will be managed to comply with the design flowrate. Sherman Jones, who has lived here for 5 and 1/2 years, said he served overseas in the Marines for 10 years. Howland ended the discussion by again referring to the EPA letter. “The significance of this letter from the EPA is they’re saying it’s not under agriculture. It is in fact a separate operation from Ringler’s. It is a commercial enterprise, which means that it’s in violation of the zoning code. “And there was no attempt on their behalf to ask for a rezone, which means that there are going to be legal ramifications for these actions,” he said.